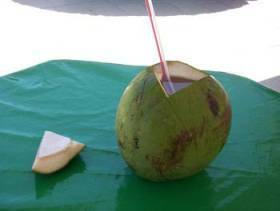 Have you ever stopped at a street vendor’s stand, a kiosk along the Malecon or at a shopping mall to have a coconut hacked open by machete so you can sip a cool agua de coco? 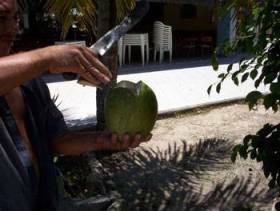 And perhaps after you draw all the agua de coco, ask to have the coconut split open so that you can scoop out the soft, almost jelly-like, white “flesh” inside? If you are from a Latin American and Caribbean (LAC) nation or live in one, you’re probably salivating right now at the mere mention of it, wishing you could have one. If you visit LAC nations and have had one, you may also remember it fondly (of course there’s always some visitors who wonder what all the fuss is about). If you visit LAC but haven’t tried one, you should — it’s part of the local experience. Have you ever wondered what happens to the parts of the coconut you do not eat or drink? I have. In some places those ‘wastes” are dutifully collected and transported to the municipal dump or landfill. In all too many locales, however, they are simply discarded nearby and left to rot. We’re not talking a small matter here. Each 250 milliliters (ml) of agua de coco you drink results in more than one kilogram (kg) of “waste” about the size of a cantaloupe. That can add up fast! In fact, officials within the Municipality of Rio de Janeiro (MRJ) estimate that on an average day some 300 metric tons (Mt) of coconut waste is generated, and during the summer months (tourism’s “high season”) this doubles to about 600 Mt every day! Officials in the northern coastal city of Fortaleza, Ceará, estimate some 40 Mt of coconut husks are generated on its two main beachfronts every day. Brazilian officials working on the issue have estimated that some 70% of the waste in Brazil’s beach areas are “empty” coconuts, and that even on the “touristically less developed” beaches of Brazil’s northwest generate 4 million Mt a year. I wish I had figures from other LAC nations, but they are hard to come by. But these should give you some concept of the scale involved. Given their size and weight, these husks can quickly eat up the space in municipal landfills. Since in the state most would arrive at the landfill — largely whole, with just one chunk missing on one end — these coconut husks will take 8-10 years to fully decompose, this potentially poses a huge waste management problem for local officials. Several years ago the for-profit firm Coco Verde joined forces with the MRJ (which includes the urban sanitation entity I wrote about earlier, Comlurb), the firm that runs the concession for Rio’s beachside refreshment kiosks, Orla Rio, and a waste management services firm, Seletiva Coleta Ambiental, to tackle this waste stream and turn it into a recycling opportunity. Under the arrangement, the kiosks of Orla Rio collect the husks from agua de coco they serve, primarily using the distinctive orange bins provided by Comlurb. 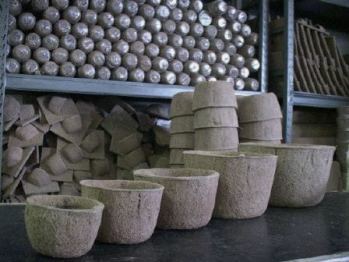 Seletiva picks up the accumulated husks and deliver them to Coco Verde, which shreds them and uses resulting coir fiber and powder to create gardening products, such as flower pots, basket liners, “growing walls,” or support poles for creepers. Focusing on these products has the added benefit of helping in the fight to saved the endangered Atlantic Forest (Mata Atlantica) species Dicksonia Sellowiana, known in Brazil as samambaiaçu. The fiber from this plant, xaxim, has been used for years to make a cheap alternative to flower pots and planters, and to create growing boards favored by flower cultivators, especially those growing orchids. Xaxim‘s use was outlawed by federal regulation in 2001-2, but many garden centers and supermarkets across Brazil continue to sell xaxim products. Coconut coir is the only substitute material for such products widely accepted by florists and gardeners. The carioca example appears to be the inspiration behind a current project in Fortaleza. The project is funded by the World Bank/Global Environment Facility (GEF) under the Development Marketplace initiative. It is managed/coordinated by the Brazilian Agricultural Research Corporation (Embrapa), a state entity associated with the Agriculture Ministry charged with promoting Brazilian agribusiness. The project has the active cooperation of beachside vendors, the municipal government of Fortaleza and its urban sanitation service, EMLURB, and the state government of Ceará. Under the project, the vendors are to collect the husks, Emlurb picks them up and delivers them to a facility they have obtained next to the Jangurussu waste sorting station and landfill. The husks will be recycled — at first, primarily to make gardening and agricultural products to be sold in Fortaleza’s gardening centers, supermarkets and florists. Embrapa does not plan to stop there — it is actively seeking other end-uses, other markets. They have talked to the rose producers of Ceará about using coconut husk powder substrate. They have spoken to buyers in Austria and Portugal about purchasing as much as 25 Mt/mo in coir fiber. Embrapa has approached automobile accessory companies in the Camaçari industrial complex outside Salvador, Bahia (Ford manufactures cars at Camaçari) about using coir as fill in their vehicle seats. They also enlisted the aid of the National Council of Scientific and Technological Development (CNPq) to investigate possible use of the residual biomass and liquid effluent from the Fortaleza project to generate electricity. Embrapa has also actively promoted the Fortaleza project as a model that other cities can emulate. As a result, Salvador, Santos (São Paulo), Cuiabá (Mato Grosso), Vitória (Espirito Santo), and Aracaju (Sergipe) and looking into setting up similar projects. If you’re an athlete or practice yoga, have you yet consumed a cold bottle or aseptic pack after your workout of what marketers have dubbed “Nature’s sport drink” or “Nature’s Gatoraid®”? That’s right, bottled agua de coco has arrived on the shelves and may well be in the hands of the guy or gal on the weight machine or stationary bike next to you. In the late 1990’s the UN Food and Agriculture Organization (FAO) did a nutritional analysis of coconut water and found that it was better overall than most commercial “sports” (isotonic) drinks — five essential electrolytes, more potassium than a banana, low acidity, no fat or cholesterol, and usually less sugar and sodium. I could write a whole separate article on the health and environmental implications of coconut water’s foray into the sport drink market (maybe I will! ), so I won’t spend more time on it here. FAO took a patent out on a simple and relatively inexpensive way to commercially process coconuts into coconut water that can be packaged and sold, and it has been licensing it out. 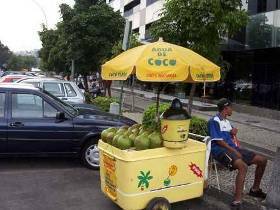 Since then a number of agricultural services in LAC nations have excitedly produced and promoted studies about the potential for producing and exporting coconut water to North American and European markets, and many companies launched for that purpose. Just last month Mexico announced plans for such plants in Michoacán and Guerrero. If you’re sipping the new “O.N.E.” drink, you’re sipping agua de coco from Brazil. If “Zico,” the coconut water is from El Salvador and Brazil. And so on. Every one of those packages represents at least one coconut husk, a bulky, heavy, slow-to-decompose waste if simply discarded. I wonder how many of these new operations to produce and package coconut water being set up in Brazil, Colombia, El Salvador or Mexico have made parallel arrangements to recycle all those husks? 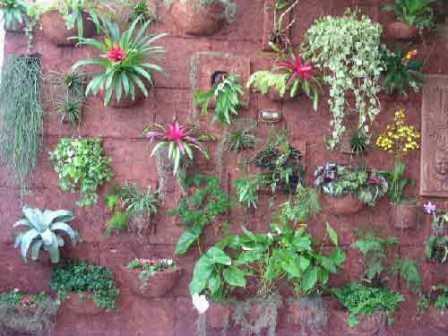 And if they have or if they do, how long before the market for coir-based flower pots and growing walls becomes saturated? In Part II of this discussion of coconut recycling, we’ll look at the options for what else can be done with all those coconuts.